“Oh boy! I'm gonna like it here,” says Annie and Sandy seems to agree. “Together at last, together forever” is the new motto of Daddy Warbucks, Annie and Sandy. Living on Easy Street at Oliver Warbucks’ Mansion. Why any kid would want to be an orphan, I'll never know! Where does our plan for Annie put us? Give you one guess… Easy Street. 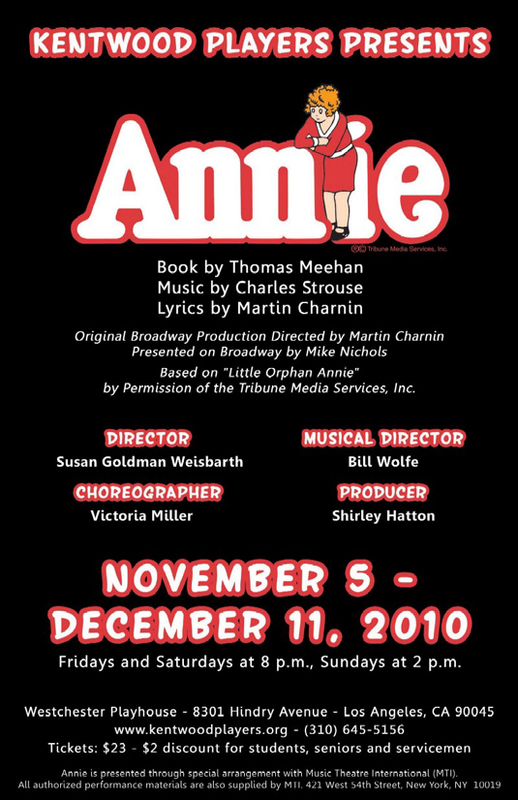 The extraordinary cast of Annie features (from top) Harold Dershimer, Rocky Miller, Shirley Hatton, Steve Holland, MarLee Candell, Jennifer Richardson, Francesca Farina and Brusier. “Oh Boy! I'm Gonna Like It Here!” says Annie. Oliver Warbucks is a man who always wins! “Rotten orphan, she never misses!” cries Miss Hannigan as Molly gleefully steps on her foot. Annie takes care of Molly, the smallest of the orphans.